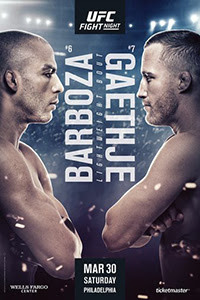 UFC on ESPN 2: Barboza vs. Gaethje took place March 30, 2019 at Wells Fargo Center in Philadelphia, Pennsylvania. • Edson Barboza vs. Justin Gaethje: Justin Gaethje def. Edson Barboza via KO (punches) at 2:30 of Round 1. • David Branch vs. Jack Hermansson: Jack Hermansson def. David Branch via submission (guillotine choke) at 0:49 of Round 1. • Josh Emmett vs. Michael Johnson: Josh Emmett def. Michael Johnson via KO (punch) at 4:14 of Round 3. • Sheymon Moraes vs. Sodiq Yusuff: Sodiq Yusuff def. Sheymon Moraes via unanimous decision (29-27, 29-28, 29-28). • Ray Borg vs. Casey Kenney: Casey Kenney def. Ray Borg via unanimous decision (29-28, 29-28, 30-27). • Mark De La Rosa vs. Alex Perez: Alex Perez def. Mark De La Rosa via unanimous decision (30-27, 30-27, 30-27).